Be ready for anything with the 7TS ALS Concealment Paddle Holster from Safariland. The open-top design, without SLS, allows for quick retrieval of a firearm. The ALS® (automatic locking system) secures firearms, allowing for a vertical draw once the release is deactivated. The concealment paddle delivers an injection-molded design that rides close to the body. This holster is incredibly rugged, engineered to stay structurally-sound regardless of extremes in temperature, from 300 to -50 degrees F, or other environmental factors. The paddle holster can remain submerged in water indefinitely without losing its form or shape. Its matte finish can be easily cleaned with a scouring pad. The 7TS interior employs SafariSeven™, a proprietary nylon blend that won't scratch or damage the firearm's finish. Additionally, the interior construction features a raised, stand-off surface that creates an air space to allow dirt and moisture to quickly clear any contact for extra protection. Safariland's holster includes an injection-molded belt loop, featuring a user-adjustable cant, and can be worn for a convenient cross draw. Need to order a second one for a tac light. I have purchased Safariland holsters in the past, and they fit the respective firearm well. However, this holster fit my Glock 26 very tight and required some 'modification' to avoid damage to the finish of the firearm. The silicone spray inside the holster made no difference. This may have been a rare occurence however, I will be very careful next time I select a holster. I'd like to be able to trust the quality of Safariland products in the future, but I am somewhat skeptical. Excellent retention, effortless lightning fast draws effortless holstering have one for my M&P 9 and one for my G20. Will buy for all future HG purchases, can not recommend highly enough. Your pants or belt will rip before the retention system fails. Can not be beat for use in IDPA. It fits great. Now my friends are purchasing the holster. 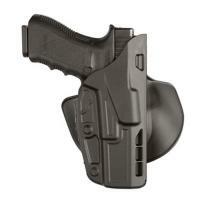 This holster fits great and holds it securely. Very smooth draw and replacement. I got it to carry my M&P in the field while hunting so I didn't need the extra retention levels. I also attached the holster to the drop-down leg attachment because I carry a backpack with a waist belt and a rifle. I always had problems hip carrying because it would interfere with the belt and get hit with the gun when shoulder carrying. Problem solved Now that hunting is over I can put the paddle back on and hip carry. Very easy to change back and forth. Definitely recommend this for basic open carry.